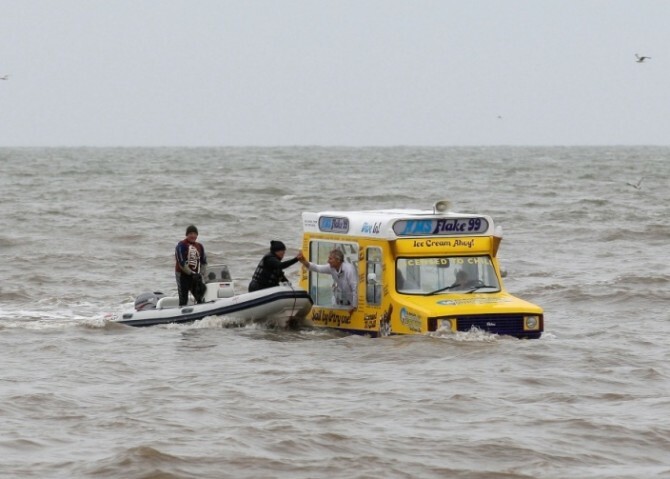 British ice cream lovers have been lining up on land and sea to get a summertime treat from the world’s first amphibious ice cream van. Christened the HMS Flake 99, after the UK specialty of a vanilla cone with a Cadbury Flake bar on top, the vehicle has a top speed of five knots when on the water. It was built in honor of National Ice Cream Week (May 30-Jun 5) by Cadbury ice cream maker Fredericks and sailed its maiden voyage on the Thames last week. After a tour of Britain’s beaches, the truck’s owners have quite the itinerary planned. “We are now considering taking the remarkable vehicle across the Channel and onto the canals of Venice to champion Britain’s beaches and give our continental cousins the ultimate taste of the British summertime,” said Fredericks spokeswoman Jenny Bostock. We’re sure the gondoliers would just love that. At the helm is stand-up comedian David Mounfield, who captained the idea of a seafaring sweets truck from the very beginning. Mounfield dreamed up the van after seeing the number of ice cream trucks in Britain dwindle after “exclusion zones” banned their bells from many residential areas on the grounds of preventing noise pollution. This one certainly wouldn’t comply with any noise regulations, as it constantly chimes the first few notes of “Sailing” by Rod Stewart. By comparison, “Turkey In The Straw” seems almost tolerable.